Recently, a southern California private label dairy plant for a major supermarket retailer came to Dorner with the challenge of creating a side transfer conveyor to transfer small yogurt containers between two conveyors with the smallest gap possible. Since this was a food processing conveyor, the customer needed to use sanitary stainless steel AquaPruf 7400 Series conveyors. 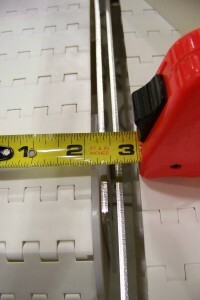 Typically, the ‘belt edge to belt edge’ distance between two standard 7400 Series conveyors is 3.6″, which was too large of a gap for the yogurt containers to make it through the transfer. With a few slight modifications to the standard 7400 Series design, the bearing assembly on the drive end of the discharge conveyor was designed to mount inboard of the conveyor frame. Also, instead of using the standard formed stainless steel frame material, the side transfer conveyors were made with flat stainless steel plates for the frame. By AJ Naber, Senior Design Engineer, Dorner Mfg Corp.